In a previous article, I talked about using qr codes in SMB marketing and also showed you unique uses of QR codes, heck, I even showed you how to create a QR code business card, however, I failed to show you how valuable QR codes are for real estate marketing. QR codes are a great tool that every Realtor should be using. They are easy to use, have a minimum or even no cost and are the new trend starting to hit both the younger and older generations. Because of these reasons, there is no reason why you should not be using QR codes for your real estate business. 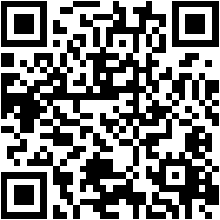 I am here to show you how to use QR codes in the real estate business. When a QR code is scanned, you have several options such as displaying a block of text, creating a contact in the persons phone or sending them to a link also known as a URL. When creating a QR code for real estate, it will normally be sending them to a URL. You will need to create a page to send potential buyers to. This page can be the listing as displayed on your firms website, however it is recommended that you create a mobile friendly page since most will be using a mobile device to scan your QR code. Make sure this page includes all information that you want to convey to this person. Creating your QR code is quick, simple and free. Just visit http://goqr.me/ and select what you would like to create. For most, you will be using URL or vCard if your creating a QR code business card. When using a URL, you will need to specify the web address, which should be the page you created above. You can also link to a YouTube URL if you would like to have a video of the property you are selling to play on their mobile device. Now it is time to place the QR code onto all your real estate marketing materials. You may want to put a quick blurb telling potential buyers to scan the QR code with their mobile device for more information about the property. This will help them to understand what the QR code means. As for placement of these QR codes, the sky is the limit. I will give you a few ideas on where you can place them. 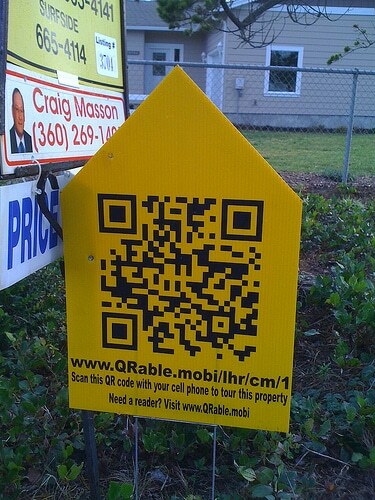 You can print your QR code on to your real estate sale signs. As shoppers pass buy the property, they will have the ability to scan the sign from their car and see more information about the property. Be sure to always test your QR codes and try to develop the right size for your QR code real estate sign. The key is to make it easy for the shopper to scan from the street. Be sure to incorporate your real estate QR codes into all print advertising and flyers you create. If you take out an ad in a magazine for a property, be sure to place a QR code into the ad. This will entice the readers of this magazine to visit your information page and find out more about that property or multiple properties that you currently have on the market. Also, do not forget to include the code on your flyers. You may feel that by just publishing a link, you are good, however, most people will not take the time to type in the link on their phone but rather take home the flyer to input it on their computer. Once home, the flyer can be lost or forgotten about. When you print your QR code onto the flyer, most that utilize QR codes will scan the flyer with their mobile device and gain instant access to your information. As I stated earlier, you can create a QR code that will link to a YouTube video. This video can contain a video walk-through of the property you are trying to sell. By scanning your QR code with their mobile device, their QR code scanning software should automatically open the YouTube video in their YouTube player. Let us know of creative ideas you have seen used for QR codes in real estate down in our comment section below. Do you have a “For Sale By Owner” package? I don’t sell any products, just write articles that help point you in the right directions. great tips Chris! We have decided to incorporate all of our print material, including business cards, with the QR code. Great! Let us know how it works out for ya.